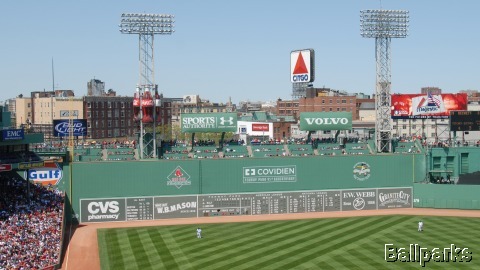 “I wish I could make my lawn look like Fenway” you know, the pattern, the lush green carpet. Well, we’d like to offer up some tips on how you can achieve something similar. 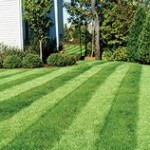 Stripes are a visual effect caused by laying (or bending) grass leaf blades over as you mow in opposite directions. 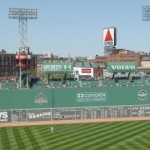 Reflecting sunlight gives the appearance of alternating light and dark green stripes. The grass blades that are bent in the direction you are mowing will appear as light green stripes and the blades bent toward you will appear to be a darker shade of green. 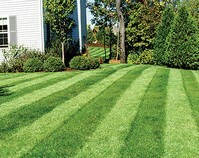 Lawn stripes are not created by using special fertilizer techniques, cutting at different heights, painting different colors of green or using different grass species. This is best achieved if you have a roller attachment on your mower, if you don’t you still can make it happen, and if you want- you can actually buy a striping kit! 2. Mow your first ‘stripe’ while keeping in mind a ‘line of sight’ to keep stripe alignment straight. 3. Continue to align ‘stripes’ paralleled to the first. Helpful Hint: Plan your pattern so that both sets of stripes are positioned diagonally with your intended line of sight. 2. Mow your first ‘stripe’ just as in the ‘Straight Pattern’ keeping a ‘line of sight’. 3. Continue to align ‘stripes’ with the original. 4. Your second pass will criss cross over the first patterned design, helping to create the checkerboard effect.